The 4th year of the annual SoundOut festival and in 2013 we will bring to you another bristling sound event to question your ears, allude to the unknown, see within the fabric of sound, and take the threads and unravel them. 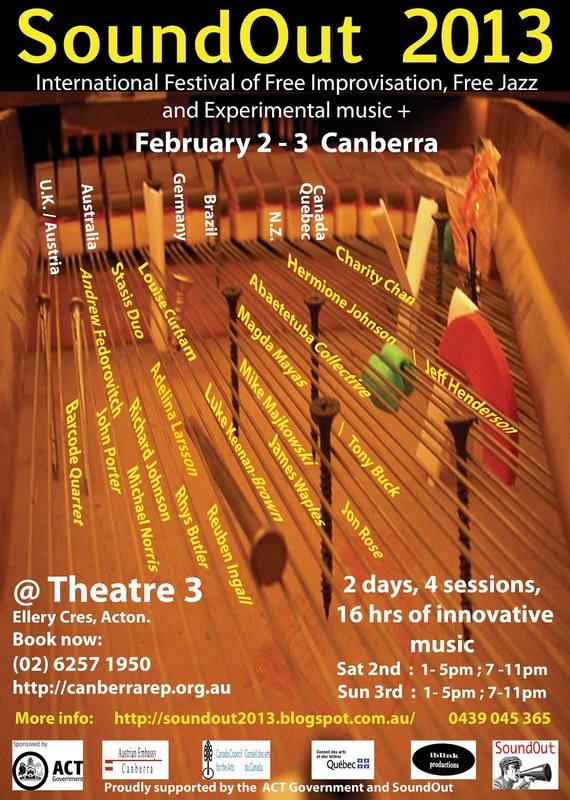 This is the Free Improvisational, Free Jazz and Experimental Music festival to replenish your ears and mind! With Artists from Australia, Austria/UK, Brazil/Switzerland, Canada/Quebec and Germany that will combine, mix, cross-fertilize, and move sound mountains to uplift inquiring ears. The 2013 group of Artists has never gathered before and never will again in the same configuration, but they are all involved in an international dialogue that is essential to the unfolding of new music structures and what it means to be human in the 21st Century. Come, see and hear the new music evolve. The State of Styria, the Austrian Embassy and Government proudly supports artists from the Barcode Quartet. Alison Blunt is partly supported in her tour by the British Council of New Zealand. The Brazilian Government proudly support the Abaetetuba Collective and the Arts Council of New Zealand support Hermione Johnson. 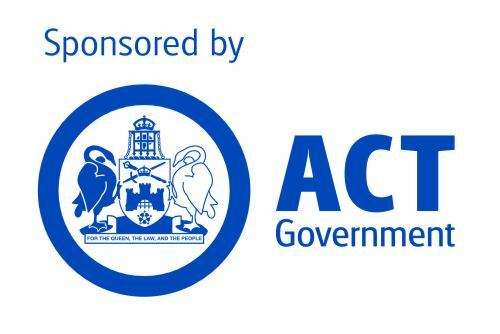 SoundOut 2013 is very grateful for the continued support from the ACT Government, as well as the BMA magazines, iblink Productions and SoundOut and the volunteers that help with the festival. Unfortunately at this late stage Adelina Larson has had to cancel her appearance and we welcome Alison Plevey as her replacement. Charity Chan due to lack of communication and personal circumstances could not make it. Alison Blunt: violin (UK) Barcode Qrt. Annette Giesriegl: vocalist (Austria) Barcode Qrt. Elisabeth Harnik: Pianist (Styria/Austria) Barcode Qrt. Josef Klammer: drums/electronics (Austria) Barcode Qrt. Rodrigo Montoya: shamisen & guitar, ABAETETUBA collective, (Brazil). collective improvisation by the musicians that performed on Saturday. + any guests. Adam was born 1978 is an Australian guitarist and experimental electronic musician whose work spans across Electro-Acoustic Improvisation, Free Jazz, Country Blues, Minimal Electronic and Psych Rock. Adam has composed music for Film, Dance and Installation and is a founding member of The Splinter Orchestra. He says "I am interested in complex forms that evolve through simple systems". His Acoustic Guitar Solo album was described in Signal to Noise journal as the "next great leap forward for acoustic guitar improvisation". Since 2000 he has worked with Matt Earle in the seminal Sinecore band Stasis Duo to critical acclaim, and has collaborated with musicians such as Jason Kahn, Shoji Hano, Will Guthrie, Oren Ambarchi, Toshimaru Nakamura, Jim Denley, Tetuzi Akiyama, Kris Wanders, Mani Neumauer, Chris Corsano and Annette Krebbs. Alison graduated from WAAPA in 2009 with a BA Dance – Honours, (LINK Dance Company). In Canberra’s 2010 Short + Sweet dance festival she received the award for ‘Best Female Dancer’. In 2012 she collaborated with Adelina Larsson and Rueben Ingall for Canberra's You Are Here Festival, performing installation work 'Resonance 1.0 - Bubble Wrap'. Alison is a recipient of the Australia Council's ArtStart grant assisting her collaboration with Adam Deusien in the formation of their collective 'Lingua Franca' in Bathurst. Her blog '100,000 frames' documents a year long site specific improvisation project in the creation of a new dance film. She has performed throughout the British Isles, and Europe in contrasting environments including Royal Albert Hall (England), Bimhuis (Holland), Musikhuset Aarhus (Denmark), St Magnus Festival (Orkney, Scotland), Horta Cordel International Festival of Improvisation (Spain), B-Flat (Germany), Stockwerk Jazz Club (Styria) and European Storytelling Marathons (Holland and Belgium) with a diverse array of artists including Performing regularly with London Improvisers Orchestra, Berlin Improvisers Orchestra, Barrel, Lode, Barcode Quartet, Sage/Haman, Ensemble Progresivo and many ad hoc improvising ensembles, Alison has also collaborated with Steve Beresford, John Bisset, Adam Bohman, Gail Brand, Javier Carmona, Viv Corringham, Guy Dartnell, Lisbeth Diers, John Edwards, Sue Ferrar, Pete Flood, Lewis Gibson, Annette Giesriegl, Wolfgang Georgsdorf, Kay Grant, Sylvia Hallett, Elisabeth Harnik, Bonnie Hart, Tristan Honsinger, Ivor Kallin, Anna Kaluza, Julie Kjaer, Josef Klammer, Dominic Lash, David Leahy, Tony Marsh, Hannah Marshall, Marcio Mattos, Neil Metcalfe, Niko Meinhold, Manuel Miethe, Miya, Horst Nonnenmacher, Adrian Northover, Noura Sanatian, Mark Saunders, Franz Schmuck, Ian Smith, Joel Stern, Benedict Taylor, Noel Taylor, Ricardo Tejero, Dave Tucker, Jackie Walduck, Ray Warleigh, Veryan Weston & Thomas Zunk. Andrew is a young Canberra based saxophonist. He recently graduated from the ANU jazz program and is currently interested in combining traditional approaches with alternative means of sound production on the saxophone (other than reed aerophone.) He has also recently become interested in the effects of creating music that lies of the fringes of human aural perception (in terms of frequency.) He has released a record with two other young local improvisors featuring Alex Masso, He has for the past three years been invited to participate in a regular Precipice event in which theatre, movement and dance improvisors collaborate with musicians (curated by Tony Osborne.) He has also recently performed at both the Nownow and SoundOut festival. He is a member of the Splinter Orchestra and in 2011 began exploring solo saxophone performance. Annette Giesriegl lives in Graz, in Austria. She is a vocalist who crosses boundaries, whose work is happily but only partially rooted in jazz. She studied jazz singing at the University of the Arts (Kunstuniversität) in Graz under Mark Murphy, Jay Clayton, Sheila Jordan and Andy Bey, during which time she placed particular emphasis on the study of improvisation. She has spent years exploring the sonic range and potential of the voice and finds musical expression for the explorations in free improvisation. She has been engaged in studies of overtone singing, throat singing and the work of vocalists such as Meredith Monk, Bobby Mc Ferrin and Sainkho Namtchylak, has taken part in workshops with the French bassist Joelle Leandre, Eddie Prevost from AMN and the vocalist Maggie Nichols and spent months in London studying Indian music with an emphasis on Indian vocal techniques. She performs regularly in the free music scene in London and gigs with musicians such as Eddie Prevost, John Edwards, Veryan Weston and Steve Beresford, and with her radical free improvisational project “Primal Fruit Cake” (see below for detailed information about the projects). Antonio is a drummer, percussionist, builder of percussion parts and free improviser. Started his career in 1963 and since 2000, he has been dedicated to improvised music, promoting this strand through performances and workshops in cultural venues, theatres, museums, art galleries and festivals. He is the founder of the Free Improvisation collective ABAETETUBA in 2004 along with Rodrigo Montoya, Thomas Rohrer, Luiz Gubeissi and Marcio Mattos. Also he is the curator of the 1st and 2nd International Festival of Free Improvisation ABAETETUBA supported by Cultural Centre of Sao Paulo. Some musicians and artists performing with him are: William Parker, Han Bennink, Phil Minton, Hans Koch, Ab Baars, Veryan Weston, Mark Sanders, Trevor Watts, Saadet Türköz, Ricardo Tejero, Raymond MacDonald, Luo Chao Yun, Audrey Chen, Peter Jaquemyn, Olie Brice, Charlotte Hug, Phil Wachsmann, John Edwards, Olie Brice, John Russell, Sabu Toyozumi, Thomas Rohrer, Rodrigo Montoya, Luiz Gubeissi. Festival Offene Ohren Munich, the Comprovise Festival Cologne, the Alpenglow Festival London, the Musicacoustica Beijing or the Umbrella Music Festival Chicago. Hermione is a composer and pianist living in Auckland, New Zealand. In recent times she has improvised with Frode Gjerstad , Cor Fuhler, Dave Brown, Ingebrigt Haker Flaten and Sean Baxter, John Bell, Gerard Crewdson and Jeff Henderson etc. She has appeared solo at Sydney's Paddington Uniting Church alongside Chris Abrahams and Monika Brooks, and with Louise Curham's 'Drunken Flower' at the Lines of Flight Festival in Chistchurch. She has performed at the Nownow, Fredstock, iiii and Bomb the Space Festivals. Her solo album 'colourcode' was released by the iiii label in July this year and is a Tayloresque tour de force of tonal whirlwinds and clusters of musical brilliance. James Waples is a Sydney based musician who is exploring the many possibilities of acoustic percussion. Although heavily involved with the Sydney Jazz scene he is also becoming equally present in the improvised music scene working with groups such as Roil trio with the renowned pianist Chris Abrahams from The Necks and the free improvising collective Splinter Orchestra based in Sydney and comprising of a list of who’s who of Sydney Improvisors. He was also a finalist in the Wangaratta Festival of Jazz drum competition in 2005. James has also performed with many of Australia's premier jazz musicians such as Mike Nock, Bernie McGann, Dale Barlow, Sean Wayland and James Muller. He is currently involved with original projects with groups such as the Mike Nock Trio, Bernie Mcgann Quartet, Waples Bros Band, Jackson Harrison Quartet, Farfinkel Pugowski, The Three Omegas, Divine Dialects, and Simon Ferenci Quartet. Jeff Henderson (b. 1973) is New Zealand’s leading exponent of free improvisation and free jazz saxophone. He has traveled and performed extensively in New Zealand and internationally as a solo artist and with numerous musical projects and theatre companies. Henderson is the founder of The Space (est. 1999) – an independent performance venue in Wellington, New Zealand dedicated to the presentation of new music, theatre and experimental performance. The Space has recently been renamed HAPPY and has moved into central Wellington As well as his work in improvised music and jazz Henderson is a composer who has written for theatre, dance and collaborative arts projects. He has performed with internationally renowned musicians Steve Lacy, Marilyn Crispell, William Parker, Evan Parker, Mark Sanders, Tony Buck, John Edwards, Steve Noble, Jim Denley, Mike Nock, Agus Supriawan and others. Current projects include Urban Taniwha with Richard Nunns and Marilyn Crispell, the Ortiz Funeral Directors, the Ecstasy Trio, Deconstruction Unit, Under Lili’s Balcony Theatre Company and numerous others. In addition to his work on reed instruments, Henderson also performs on piano, electric bass and assorted other instruments. Henderson has toured and performed internationally in Switzerland, France (1994), New York (1999, 2001, 2002), London, Woodstock (2001), Amsterdam (2002), Norway (2002) Sydney, Melbourne (2002, 2003) and has been invited to perform this year in Australia, Europe and New York. Currently he is Artistic Director of the Wellington International Jazz Festival, Artistic Director of the Bomb the Space festival, Director of The Space and runs two record labels: Spacecds and Open Music Envelope (with Tim Nees). Born in Toowoomba in 1985, John is a formidable young saxophonist with a deep interest in free improvisation. After starting on the clarinet at an earlier age he switched to the tenor saxophone and never looked back. In 2003 John moved to Brisbane to study music full-time, completing a Bachelor of Music in 2005 and a Master of Music in 2008 where his thesis was on the avant garde composer Cornelius Cardew. It was during this time that John received his first exposure to improvised music, participating in a number of groups in and around Brisbane. He has since played with a number of artists including Shoji Hano, Jeff Henderson, Kris Wanders, Madoka Kouno, Elliott Dalgleish, and the Stasis Duo, and appears on recordings released by the [Array] and Homophoni labels. John currently lives in Canberra and has started to play in a saxophone Quartet with Andrew Fedorovitch, Rhys Butler and Richard Johnson. He loves playing music to birds and animals in a dialogue with the sound-scapes around him, as it were. Jon Rose performs his group projects and solo music in upwards of 50 concerts every year - in North America, Japan, Australia, South America, China, Scandinavia and just about every country in West & East Europe. He is featured regularly in the main festivals of New Music, Jazz and Sound Art e.g. Strasbourg New Music Festival; New Music America; Moers New Jazz Festival; European Media Festival; The Vienna Festival; Ars Elektronica; The Northsea Jazz Festival; Dokumenta; Roma-Europa Festival; Festival D'Automne; Festival Musique Actuelle; The Berlin Jazz Festival, etc. Rose has also been invited to curate Contemporary Music Festivals in Germany (e.g. Berlin Urbane Aboriginale) and Austria (e.g. Wels 'Unlimited'). He has curated his own festival "String 'em up" of radical string players and their instruments, taking place in Podewil, Berlin in 1998 and Dodorama and V2, Rotterdam in 1999, Tonic, New York in 2000, Mains D'Oeuvres, Paris in 2002, and IPR, New york in 2010. In March 2012 Jon won the Australian Don Banks composer award in Sydney. Josef studied drums at Music University Graz. Since the middle of the 80’s this musician and media artist has worked continuously developing his instruments and sound whilst maintaining his involvement in research and the transformation of media immanent music potentials. In 1994 Award for computermusic, Ministry of Art and Science; 2003 Elektronic Award 2003 for the “Klammer&Gruendler Duo“, of the ELAK Vienna and Musikforum Viktring exhibitions, sound installations and music Projekte in Vienna, Hongkong, Sevilla, New York, Karlsruhe, Berlin, Darmstadt, Katzow, Rimini and Paris. He does music for TV and movies; radio plays and radio programs for the ORF (Austrian Braodcast Corporation). Also he is involved with stage music for productions at theatres in Hamburg, Stuttgart, Schwerin, Gera, Ljubljana, Klagenfurt, Linz and Graz and in Wiener Festwochen. He was the Artist in Residence at ZKM Karlsruhe (08) and IEM / Musik University Graz (01, 03, 08, 09). Josef is also involved with numerous and regular concerts and recordings with a wide variety of ensembles playing New Improvised Electronic and Experimental Music. He was on the Jury for Prix Ars Electronika (Digital Music), Styrian Cultural Initiativ and IGNM/Austria. He is also Curator for diverse festivals and initiatives, music projects / school workshops. Louise is a Canberra-based film maker/visual artist. Working predominantly with found and obsolete moving image materials, Louise’s work addresses the givens of cinema – specifically its usually fixed relationships between projection, audience and image. She works in film performance, installation and experimental film and extensively with sound art and music. Past (and continuing) collaborations include David Young, Alister Spence and Mike Cooper. He began his musical studies on piano and electric bass passing to double-bass at age 23. Taught in harmony Jazz and Bossa Nova with the pianist Samuel Jr. Khuri. Participated in groups of Rock, Jazz, Bossa Nova, Classical Music among other styles. Dedicated to free improvisation music since 2004, being a member of musical group ABAETETUBA along with the musicians Antonio Panda Gianfratti, Rodrigo Montoya and Thomas Rohrer. He also participated in the recording of the CD Abaetetuba with the Brazilian cellist and bassist Marcio Mattos. He has played with many improvisers as Marcio Mattos, Sabu Toyozumi, Roger Turner, Urs Leimgruber among others. Mayas studied jazz and improvisation at Universität der Künste, Conservatorium van Amsterdam in 2001 under Misha Mengelberg and completed a diploma at Hochschule für Musik Hanns Eisler under Georg Graewe in 2005. During this time she began developing a specific set of techniques for inside-piano performance. Mayas has concentrated her musical investigations on the piano and its sonic possibilities, utilizing extended techniques, amplification and preparations as a process of abstraction, whilst focusing on the physicality of both internal and external parts of the piano. As a continuation of this research Mayas founded the festival Tasten-Berliner Klaviertage featuring contemporary and innovative approaches for the piano. Mayas performs internationally in a variety of roles as interpreter, solo and in collaboration with a large number of musicians and composers: in a duo with Tony Buck, in the trio Phono Phono with Michael Renkel and Sabine Vogel, the Quartet Mayas/Nutters/ Olsen/Galvez and as part of the Amsterdam based N-Collective. Over the years Mayas has performed with many leading figures in improvisation such as Andy Moore, Steve Heather, Annette Krebs, Andrea Neumann, Axel Dörner, Michael Zerang, Johannes Bauer, Christoph Kurzmann, Thomas Lehn, Tristan Honsinger, Frank Gratkowski and Michael Moore. Mike holds a BMus in Jazz Performance (First Class Honors) from Sydney’s Conservatorium of Music. A founding member of the Splinter Orchestra (since 2002), Mike is a long time devotee to the NOW now and to the improvising community in Sydney. As a double bassist, he has recently been focusing on solo playing, and is currently exploring how the use of refined extended techniques develops the sound and style of the work, and how these technical possibilities create dialogues between each other and within one another. He recently performed live to air on ABC Classic FM’s ‘New Music Up Late,’ as part of ‘Talking Back To Media’ a project led by Jon Rose, which also included Amanda Stewart, Chris Abrahams, Peter Farrar, Martin Ng, and James Waples. His Duo CD “Blip” with saxophonist Jim Denley has received rave reviews from musicians. He currently performs his solo work live using guitar, vocals and puredata patches. He released a CD of this work in 2010, which led to being featured on New Weird Australia's 'The Sound of Young Canberra' compilation release, and a string of showcase performances such as at the 2011 You Are Here festival and at the FBi Social in Sydney. He has since played at events such as The Silent Hour (Syd), Electrofringe and Crack Theatre festivals (Newcastle), UTS Refraction (Sydney) and the Hellosquare Peking Spring festival, and supported acts such as Seaworthy, Scattered Order, Defektro, 3ofMillions, Kris Keogh, Dead Meadow, Horse Macgyver and Spartak. In 2011 Ingall collaborated with dancer Adelina Larsson to create a performance for the Canberra Contemporary Art Space 'Close Range' performance event. The result combined sound art, movement, installation and improvisation. The success of this performance earned the duo an invitation to develop the work in the Canberra Museum and Gallery ‘Gallery4’ space for a series of performances in the 2012 You Are Here festival and an invitation to SoundOut 2013. Rhys has come to know the cities he has lived in through improvised and noise music. The trio Dinner Sock (Stephen Roach (drums), David Keyton (feedback), and Rhys Butler (saxophones)) formed from the weekly Fugue State Sessions in Guanzhou. The group performed with local experimenters such as Yan Jun, Feng Hao and Li Zenghui and collaborated with musicians transiting China such as Uwe Bastiansen (Faust) and Lucas Abela. Despite living in different corners of the world, Dinner Sock has continued to participate in China's experimental music scene and played Beijing's Sally Can't Dance festival and NOIShanghai in 2012. In Santiago, Chile, Rhys participated in events run by Productura Mutante and played in the free for all Collective Improvisation NO. Now residing in Canberra, Rhys is working in a duo with Reuben Ingall (live processing) and a reeds quartet with Andrew Fedorovitch, John Porter and Richard Johnson. Richard performs with the texture of sound on soprano/baritone saxophone and bass clarinet and in the last couple of years has been experimenting with instruments made from the conical gourds from PNG. These particular gourds allow the stripping back of the wind instruments to their most visceral and most sensuous form and allow for the exploration of the fundamentals of sound production with extended techniques. His work as a Performer and Presenter has been supported by the ACT Government through artsACT in 2003, 2011 and 2013; and by the Norwegian Embassy in 2010, 2011 and 2012 and the French Consulate in 2012. He has performed at the What is Music Festival, Nownow Festival; the Make it Now performances; also performances with the Brice Glace Ensemble and the 102 Club Orkestra in Grenoble France 2004; “Whip it“ series in Sydney; various Precipice annual Improv workshops hosted by Tony Osborne as well as hosting local/interstate/international improvisation nights in Canberra and as being the Producer/Director/Curator and performer at SoundOut 2010 – 2013. As a sound artist he was commissioned by the Casula Power House in Sydney to collaborate with renowned Artist Savanhdary Vongpoothorn to produce a 30-minute Soundscape for the Australia Exhibition at The Casula Power House in Sydney 2008; in 2010 he collaborated with glass/conceptual artist Denise Higgins on a soundscape for her show in Melbourne. He has performed with the likes of Jim Denley, Mats Gustafsson, Robbie Avenaim, Jerome Nottinger, Xavier Querell, Kim Myhr, Clare Cooper, Richard Ratajczak, Cameron Deyell, Tony Osborne, Clayton Thomas, Isaiah Ceccarelli, Yan Jun, Laura Altman, Michael Norris, Evan Dorian, Reuben Lewis, Christine Abdelnour, Philippee Lauzier, Eric Normand, Sam Pettigrew and Rishin Singh. He is currently working in an electro-acoustic duo with Michael Norris and a wind qrt with Andrew Fedorovitch, John Porter and Rhys Butler. Rodrigo studied jazz and Brazilian traditional music at the Free University of Music (ULM) in Sao Paulo. In 2002 he studied saxophone and improvisation with Yedo Gibson. In 2006 he entered at Minyo Association of Japanese Culture in the japanese community of Sao Paulo, where he began to study the Tsugaru-shamisen, a traditional Japanese instrument. He is dedicated to the free improvisation and traditional Japanese music. In 1999 he played flamenco guitar in the play: Estrada de um Andaluz, directed by Rosi Campos. From 2003 until 2005 was part of Brazilian folk music orchestra "Zohyo d’agua" lead by the bassist / composer Ricardo Zohyo. In 2004 he joined since its inception in the group of Free Improvisation Abaetetuba along with the musicians Antonio Panda Gianfratti, Yedo Gibson, Renato Ferreira, Luiz Gubeissi and Thomas Rohrer. In 2006 join the Minyo Japanese folk group performing concerts in theaters and festivals around the capital and countryside of Sao Paulo. In Europe he has collaborated with musicians and artists from many parts of the world: Marcio Mattos, Steve Beresford, John Edwards, Alex Ward, Steve Noble, Moshi Honen, Lê Quan Ninh, Roger Turner, Veryan Weston, Javier Carmona, Ricardo Tejero, Paloma Carrasco Guillaume Viltard, Raymond Macdonald, Kirstie Simson (dancer), Max Reed (dancer), Alex Reuben (filmmaker), Sabu Toyozumi, Caroline Kraabel, Luo Chao-yun, Terry Day, Damo Suzuki, the workshops Eddie Prévost, Foco_Orquestra of Improvisation in Madrid, London improvisers Orchestra and many others. Since 2005 Thomas has performed in a duo with the percussionist Panda Gianfratti and has worked together with the double bass player Celio Barros since 1996. He is a member of the Trio TEC; the collective of free improvisation Abaetetuba; is part of "A Barca" and has a duo with the singer Saadet Türköz from Kazakhstan, performing at concerts and festivals in Brazil and Europe. Also he plays in a trio with Hans Koch and Panda Gianfratti, beyond the quartet with Rob Mazurek, Mauricio Takara and Miguel Barella. He plays occasionally in groups of the Italian percussionist based in NY, Alessandra Belloni. While resident in London he played with the London improvisers Orchestra, and performed with various local improvisers. He is the curator of the two International festivals of free improvisation Abaetetuba that took place in 2010/11 at the Cultural Center of Sao Paulo. In 2011 he played in a band accompanying the legendary American saxophonist Yusef Lateef at his shows in Brazil. In the area of improvisation he has collaborated with musicians as: Saadet Turkoz, Panda Gianfratti, Hans Koch, Phil Minton, Celio Barros, Audrey Chen, Marcio Mattos, Rodrigo Montoya, Abaetetuba, John Russell, Diatribes, John Edwards, Phil Wachsmann, Charlotte Hug, Raymond MacDonald, Catriona MacKay, Lol Coxhill, Nichole Mitchell, Jason Adasiewicz, Miguel Barella, Javier Carmona, Chief Alonso, Terry Day, Hannah Marshall, Sabu Toyozumi, Luo Chao Yung, Ollie Brice, Veryan Weston, Mrs. Agnes, Trevor Watts, Xavier Erkizia Rob Mazurek, William Parker, Mauricio Takara, Chris Mack, Ricardo Tejero, Mark Dresser, Yusef Lateef, Josh Abrams, Ingebrit Haker-Flaten, Ute Wassermann, Adam Bohmann, Satoshi Takeishi, Adam Linson, Roger Turner, Alex Ward, Adam Linson . Early in his musical life, after having graduated from the New South Wales Conservatorium of Music, he became very involved in the jazz scene in Australia, often touring with visiting international artists such as Vincent Herring, Clifford Jordan, Mickey Tucker, Branford Marsalis and Ernie Watts, as well as Australians Mark Simmonds, Paul Grabowsky, The catholics, Sandy Evans and Dale Barlow. Following time spent in Japan, where he formed PERIL with Otomo Yoshihide and Kato Hideki, Tony moved to Europe, and has involved himself in many projects there, including the development of new "virtual" MIDI controllers at STEIM in Amsterdam. Tony has played, toured or recorded with, among others, Jon Rose, Nicolas Collins, Tenko, John Zorn, Tom Cora, Phil Minton, Haino, Switchbox, The Machine for Making Sense, Ne Zhdall, The EX, Peter Brotzmann, Hans Reichel, The Little Red Spiders, Subrito Roy Chowdury, Clifford Jordan, Kletka Red, Han Bennink, Shelley Hirsch, Wayne Horvitz, Palinckx, and Ground Zero.